After a string of encouraging performances, regally bred Second Bullet produced a career-best performance to power to victory over 2000m at Flemington on Saturday. The gelding is a son of super sire Encosta De Lago, out of star Group 1 winning mare Private Steer, and his fourth victory in 14 starts took his career prizemoney past $100,000. Trainer Danny O'Brien was pleased with the performance of his charge, who now has two wins and a third placing from his three runs at 2000m. "This horse has shown us plenty of promise throughout his career, however since his gelding he has been very genuine every time he has raced. 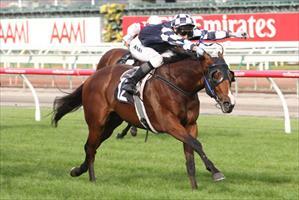 It was great for him to win here at Flemington," O'Brien said. Jumping from the outside gate, jockey James Winks was able to give his mount cover tracking three-wide in the run, before he produced him into the clear at the top of the straight and the four-year-old proved the best stayer surging to the win. "The horse travelled sweetly throughout and I didn't have to go for him until the final 200m and he put them away for a soft win in the end," Winks said.